Steel edge rubber waterstop is a kind of buried rubber waterstop. It is a modification of traditional rubber waterstop due to its steel edge of two sides. Steel plate is galvanized steel; rubber part is made from natural rubber or synthetic rubber, adding various additives and fillers, through the process of plasticizing, mixing, pressing, forming. Rubber part can have center bulb or not. The waterstop can be divided into high-strength area, water-proof area and the installation area, and installation area has punched holes to install easily. Its unequal thickness structure can ensure each part of the sections can get uniform and reasonable force. It has high tensile strength, good waterproof performance, good elasticity, can resistant to rust, wear, aging, tear, corrosion, can waterproof well. 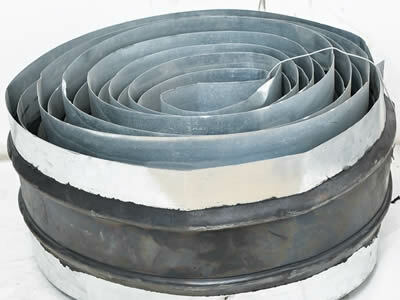 It is usually used in water conservancy projects, dams, tunnels, basements, slabs, wall junctions. Center bulb species: bridge type, mountain type, P type, U type, Z type, T type, H type, E type, Q type, etc. Waterstop species: buried rubber waterstop, back stick rubber waterstop. Length, width and thickness can be customized. Note: If there are other requirements, inspection items can be appropriately added according to buyer and seller. If evaluating mold test in line with users, its anti-mold property should be equal to or above Grade 2. High tensile strength, good waterproof performance, good elasticity. Rust, wear, aging, tear, corrosion resistance. Unequal thickness structure can ensure each part of the sections can get uniform and reasonable force. Can withstand greater tension and torsion than traditional waterstop. Galvanized steel and concrete can stick well. Steel plate has punched holes to install easily. Steel edge rubber waterstop is used for construction joints, expansion and contraction joints and deformation joints to prevent water seepage, leakage and ensure the life of project. It is suitable for water conservancy projects, dams, tunnels, basements, slabs, wall junctions, conduit joints, underground engineering, culverts, tunnels, subways, reservoirs, retaining walls, canals, sewage treatment and water treatment plants, elevator pits, roof, parking decks, bridge decks, abutments, etc.